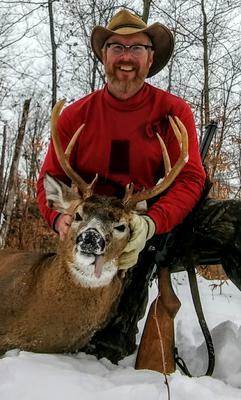 Gary Askins with this Adirondack 9-point, 170 lb buck shot after church on November 18, 2018 at 2:18 pm. Thick briars hid this buck till he moved as I still hunted in 9 inches of snow. Putting a 16th notch in the Marlin 336 .35 caliber , that's all Adirondack bucks. Warren county.